How Do We Experience Christ’s Presence in Us? Do you experience Christ’s presence acting in you through the power of the Holy Spirit? While we receive the Holy Spirit in baptism, many of us do not experience the reality of Christ present and alive in us as he promised. Why is this? I lived my life for many years in a way that buried Christ’s presence in me rather than allow that presence to be manifested. I believed in God, attended Mass regularly and participated in the sacraments. Yet my Christian faith had become secondary to other so-called priorities, namely my career. I didn’t recognize God’s presence in my life, and no one else did either. 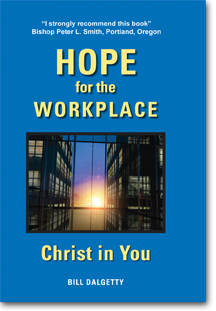 Because I had compartmentalized my life, the blessings of Christ’s truth, compassion and healing power were not available to the area of my life that needed them most – my work life. I put Jesus in a box and separated my professional life from the reality of Christ’s presence in me. That all changed one evening when I met Jesus in a new and personal way in a parish Life in the Spirit program, and some people prayed with me for the release of the power of the Holy Spirit. Before that evening, the words of Jesus in John 14:23 that he and the Father wanted to dwell in me were just words. After that evening, they became real. I began to experience the presence of God and the fullness of the Holy Spirit in a new and deeper way. I stopped burying the Christ that was in me! The same Holy Spirit that Jesus said would empower the disciples to be his witnesses throughout the earth is waiting to be released in you and me to renew our faith, to draw us into a closer relationship with the Father, and to build God’s kingdom in the circumstances of our lives. I would love to hear from you about how you have experienced the Holy Spirit and God’s presence in your life. This entry was posted in Christian life and tagged Baptism in the Holy Spirit on May 26, 2015 by Bill Dalgetty. Jesus was declaring that the God of all creation, who is responsible for bringing into existence all that is, was not just his God and Father, but our God and Father as well. This God and Father, though creator of the universe, is personal and allows himself to be possessed by us – an extreme act of humility! His becoming one of us in the person of Jesus was also an extreme act of humility. Submitting his human life to torture and death for our sake was an extreme act of love! Jesus tells us that we can possess this extremely humble and loving God if we open the door to our hearts and accept his offer to dwell in us. “Here I am! I stand at the door and knock. If anyone hears my voice and opens the door, I will come in and eat with him, and he with me.” (Rev. 3:20) If anyone will love Jesus and obey his teaching, he says, “My Father will love him, and we will come to him and make our home with him. (John 14:23) Think of it – Jesus and the Father taking up residence in us through the power of the Holy Spirit! Story: For several years Joe operated his dry cleaning business without much thought or concern for his customers or employees. As Joe observed, “I used to lie to my employees and they would steal from me.” His home life wasn’t much better. “I wasn’t really there for my wife and kids. “The Lord has blessed me so much since then,” Joe continues. “He gave me a desire to love and serve my customers and to train and spend time with my employees. My customers say, ‘You’ve changed!’ Through a survey by the Southwest Dry Cleaners Association, my business was rated number one in customer service. Joe opened his heart to Jesus Christ and now the God of all creation is Joe’s God and Father. Would you like the God of all creation to be your God and Father? This entry was posted in Christian life and tagged Possessing God on May 19, 2015 by Bill Dalgetty.